When thinking about a destination wedding, you will find lots of good reasons to do it. The first one is that there are many places to choose from and each one is exceptional and ideal for couples wanting a destination wedding; marvelous places where everything, from idyllic beaches and waterfalls to the world’s oldest cities, are perfect settings for your dream wedding. Another reason is that a destination wedding usually costs less than a traditional wedding, and it can also be the perfect occasion for family and close friends to enjoy spending time together before your wedding and while celebrating this special event. However, there will be some of your dearest relatives or friends that, for different reasons, will not be present at your destination wedding. So, if desired, you can schedule a party for all the people that could not share these special moments with you when you get back. Wedding reception wording after destination is used in an invitation when the bride and the groom decide to host a reception or party after their destination wedding for those people that they love and for different reasons could not be present in this special occasion. In this invitation you will tell your guests when and where your destination wedding took place, and the rest is a formal or informal wedding reception wording. Wedding reception wording after destination usually follows certain protocol called etiquette, which mostly outlines what is traditional. Etiquette requires you to think about some aspects that are likely to come up ahead of time to avoid an uncomfortable situation. We have an enthusiastic and experienced staff that can give you the best advice on any topic related to destination weddings; we will answer any question you have, just contact our planner at All-Inclusive Weddings.com. We are always happy to please you. Wedding reception wording after destination includes providing details such as the venue, time, and kind of event, that is, if it is formal or informal; if there will be dancing etc. You need to also specify whether children are allowed or not. Wedding reception wording after destination is actually almost the same as a common wedding reception wording; the only different in this invitation wording is that you let your guests know that your wedding ceremony has already been held some time before, you should state where and when it took place, and now you are hosting a reception for those you love and could not be present in your wedding ceremony. There are certain conventions that you can use when writing your wedding reception wording after destination. For example, you should give all the basic information that is needed, much like you did in your wedding invitations. First, you should talk about the occasion, which in this case is the wedding reception after destination. Then you should specify the time that the reception will start, as well as the location where the reception is going to take place. You must indicate the time of the day it is going to take place, as it usually conveys the kind of food that will be served and the formality of the event. That is, you may have a casual breakfast; an afternoon cocktail party which, depending on the venue, is informal or semi-formal; or an evening dinner which is habitually formal. “The pleasure of your company is requested at a dessert reception…” which involves a nice option instead of a complete dinner. “Adult Cocktail and Dinner Reception at five o'clock in the evening…” implies that it is just for adults and no kids are allowed. “As we continue in celebration, kindly join us for dinner at seven o'clock in the evening…” is great for couples planning to host a wedding reception after destination. Wedding reception wording after destination should match the tone of your reception. If you are planning an informal reception or an elegant and sophisticated one, you can incorporate your wedding colours. Coral, yellow and green shades are ideal to add an informal tone to your invitation, while different sandy, cream and blue shades will add a sense of formality. Be sure your wedding reception wording after destination will be a perfect request to make sure that your guests will enjoy with you this outstanding occasion. Our experience allows us to customize your destination wedding and guarantee the best results. 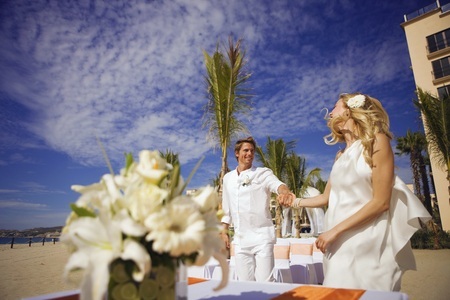 We will do everything we can to guarantee you a perfect destination wedding. We will make it just the way you have dreamed it.